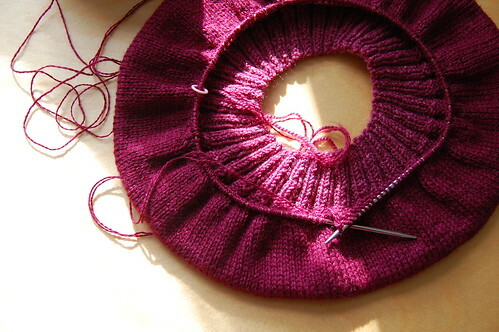 What I’m currently working on – a plain slouchy beret. The ribbing is Koigu and the body of the hat is that Skaska merino/silk laceweight, held double – love it! Pretty! Can’t wait to see the completed beret! What a beautiful color! anything but plain, in that gorgeous color! That is not the kind you’d find at a second-hand store. The merino/silk must make it quite delicious. That is gorgeous! I love the look of the plain beret (though I am convinced that I look very silly in them). OK, now I have that song in my head (not necessarily a bad thing). It is a pretty color. A beret fit for (a) Prince(ss)… It looks lovely! So pretty, what a great colour. Bright colours are so cheery in the winter. I also now have the song in my head, but that’s okay as I do love a good Prince tune. I love that color–something so bright doesn’t need any embellishment in the pattern. I knit a raspberry beret not too long ago!